Transfer to hotel. Full day sightseeing tour of New Delhi & Old Delhi to include the Mughal gardens, India Gate, Parliament House, Bahai Temple & the Qutab Minor. Lunch will be atlheMehrauli village complex. After lunch proceed to the historic Old City, visit Rajghat, Memorial to Mahatma Gandhi, India's largest Mosque the Jama Masjid, visit to the famous silver street " Chandini Chowk" & the magnificent Red Fort, where you shall also witness a son-et-lumiere. Dinner at a restaurant called Chor Bazaar, where the buffet is spread on a vintage car. Overnight Delhi. After breakfast drive to Agra. Check into hotel. Post lunch tour of the Taj Mahal and the fabulous Agra fort. Evening free at leisure. 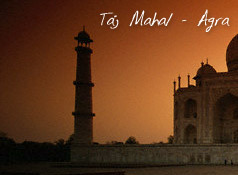 Overnight Agra. Drive to the fascinating Samode palace in the desert near Jaipur. Overnight Samode Palace. Drive to Mandawa. (3 to 4 hrs.) Check into palace hotel. Afternoon explore the painted haveliesofShekhowati. Overnight Mandawa. Morning drive to Bikaner arriving by lunch. Check into palace hotel. After lunch tour of Junagarh fort, where beyond the massive walls, rise picturesque pavilions, delicately ornamented balconies and windows in hundred different designs, murals and frescoes, mirror studded walls, blue and white Chinese tiles, mosaic floors & the finest of carvings. Also visit the Ganga Golden Jubilee Museum which has a good collection of terra-cotta potteries 5000 years old & centuries old miniature paintings. Overnight Bikaner. Morning drive to Jaisalmer arriving by lunch. Check into your heritage hotel. Jaisalmer is in the heart of the Thar desert. Evening free to explore the fortress town, through narrow streets leading to Jain temples & havelies with most exquisite stone carving in golden honey yellow stone. Overnight Jaisalmer. Day return tour of Sam sand dunes for camel rides and view the magnificent sunset over the Thardesert. Overnight Jaisalmer. Full day tour of the fort & Palace. Evening transfer to railway station to board overnight train to Jodhpur. Overnight train. Arrive Jodhpur early morning. Transfer to palace hotel. Afternoon tour of Meherangarh fort and the grand Umaid Bhawan palace. Overnight Jodhpur. Drive to Udaipur via the famous marble temple of Ranakpur (5 to 6 hrs.) Check into hotel. Evening sunset boat ride on lake Pichola. Overnight Udaipur. Day free to explore this fairy tale lake city. Overnight Udaipur. Fly to Jaipur Check into palace hotel. Afternoon sight-seeing of the city palace, palace of winds and the observatory. Overnight Jaipur. Morning excursion to Amber fort on elephant back. 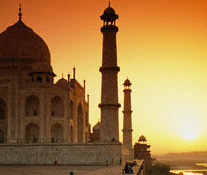 Later explore the colourful bazaars of the pink city and then drive to Delhi. Transfer to Waterbonks island resort near Delhi (only 25 kms from International Airport) can be reached only by boats & the place abounds with a variety of birds, deer & lots of flora & fauna. Evening farewell lakeside bar-be-que dinner. Late night transfer to International Airport to board your flight or ovejdKqht at cottages for early morning flight.